Support for Linux is limited, however, ITS has successfully configured and connected Linux devices to eduroam. 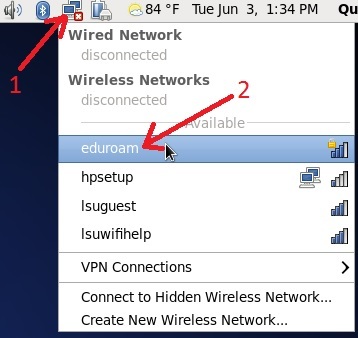 The following steps will show you how to connect to eduroam. 1. Click on the Network Manager icon on the top right near the clock. 2. Select the eduroam wireless network. 1. 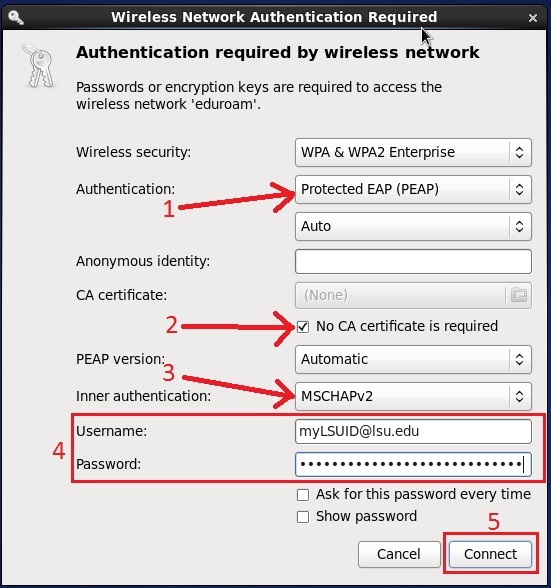 Change the "Authentication" field to Protected EAP (PEAP). 2. Check the box labeled "No CA certificate is required." If there's no checkbox, leave CA Certificate field as (None) or (unspecified). 3. Make sure the "Inner authentication" field is MSCHAPv2. 4. Type in your myLSUID@lsu.edu and password. NOTE: it is very important that you end your myLSU ID with @lsu.edu (for example, if your myLSU ID is mtiger1, type in mtiger1@lsu.edu for your username). 5. Click the "Connect" button. Note: If you can connect to eduroam but cannot access the internet, and have already tried restarting and reconnecting, you may need to disable IPv6 for this connection.